The New Year’s trip to Hong Kong included a return visit to Peking Garden, one of the nice restaurants that are part of the Maxim Group. I’ve enjoyed dining there many times over the years and was glad to see that everything is still up to the standards I remembered. As an added bonus, we were joined by an ex-Xangan and his partner, who were still in town. P.S. – I’m not still in Hong Kong; just takes me a while to get all the pictures posted and entries written! We enjoyed a set lunch for six that worked out to about US$40 per person, if memory serves. May sound expensive for a lunch but as you will see, it was quite a lunch. Plus, the setting and service are very nice. 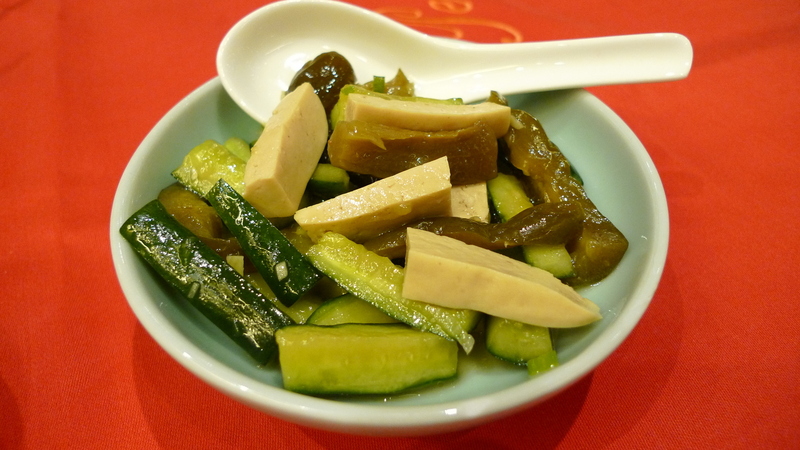 As we arrived, pickled vegetables and tofu were set out for us to munch on as we ordered. The first dish of the set was jellyfish, a traditional Chinese delicacy. For some reason, the menu’s English description of this was “sea blubber,” which of course is as inaccurate as it is unappetizing! If you haven’t had it, the dish is served cold and the texture is slightly crunchy with a pleasant, slightly salty taste. An unusual texture if you haven’t had it but very agreeable. The next dish featured pork spareribs, braised and served in a rich gravy. These were nice and tender so eating them with chopsticks was easy. 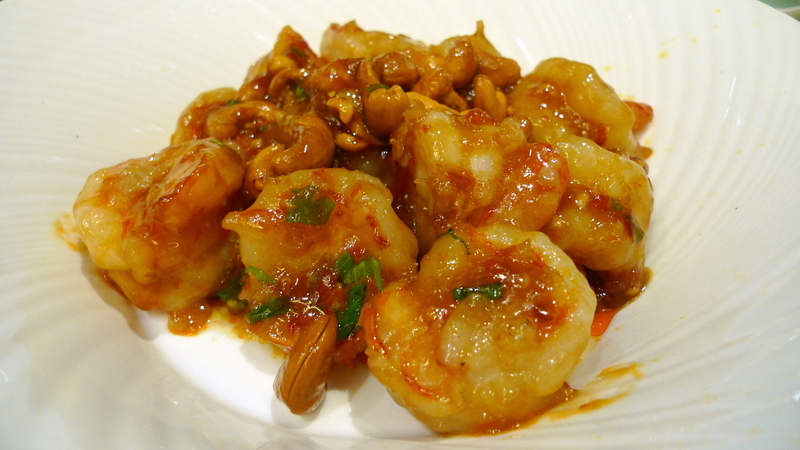 The next dish was a sweet and spicy prawn dish. You can’t tell the scale from this picture, but these were very generously sized prawns, very fresh and of excellent quality. Normally, prawns in many restaurants are basically just large shrimp. These were genuine prawns and such a pleasure to eat. 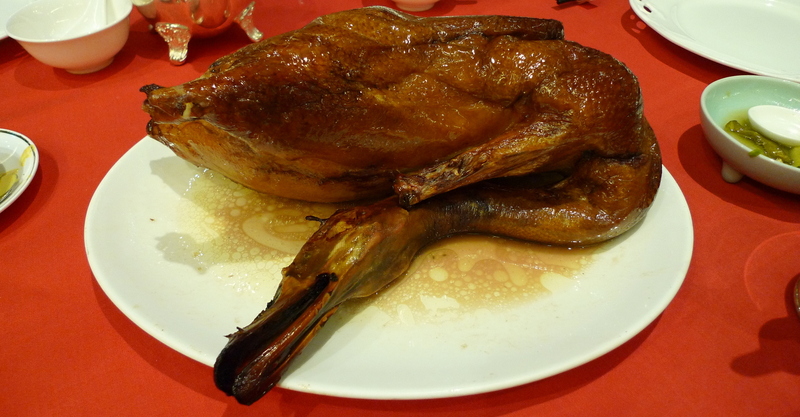 The star of the meal (and a dish for which the restaurant is famous) was the Peking Duck. It was presented at the table for photos and then taken to a nearby cart where a waiter expertly whittled off the skin into slices. Unlike some restaurants, Peking Garden also includes a layer of meat with the skin, which I very much like. At many restaurants, the meat would be served on a platter along with a stack of pancakes (crepes) and garnishes. Instead, the servers at Peking Garden prepare the pancakes for you, each with some hoisin sauce, cucumbers, green onions, and a piece of the crispy-juicy-fatty duck skin. Little packets of heaven! Notice the gorgeous tableware, too. The final main dish was fried white fish in a sweet and sour sauce. The fish was also very fresh and of good quality. Just a pleasant was to wind down the meal. 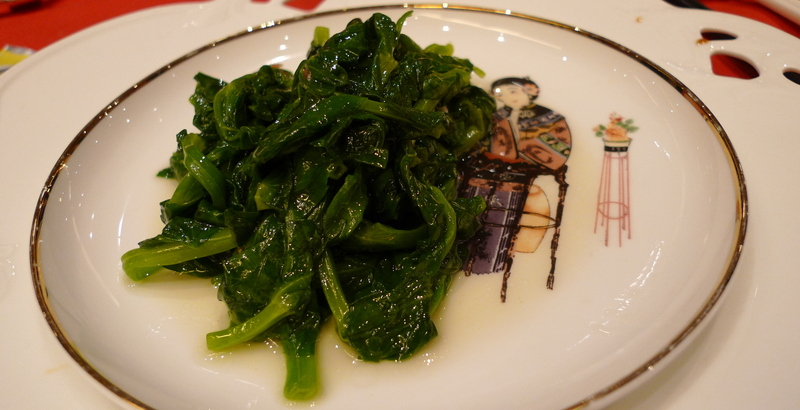 Some stir-fried greens provided some needed roughage! And dessert was a simple plate of fresh fruit. In general, Chinese meals don’t tend to have a lot of dessert. 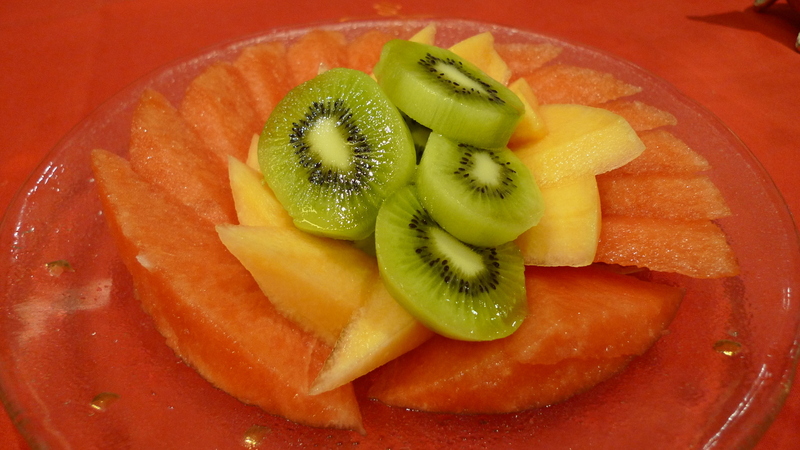 If not fruit, it is a simple dish that is usually not super sweet. Big chocolate lava cake would be out of place. Something that I really appreciate about Chinese food is its ability to achieve such nice balance. Overall, the meal was a success on all levels: food, service, decor, company, etc. Peking Garden will remain on my to-visit list. This entry was posted in Food, Travel and tagged Chinese, cuisine, Dining, food, hong kong, Peking Duck, Peking Garden, Restaurant by christao408. Bookmark the permalink. Sea blubber? lol… I enjoy jelly fish. Your blog entry is a great procrastination vehicle for me today. I’m day dreaming away … thinking of that prawn dish and the tender ribs. I am glad my attempts to derail your productivity have worked! Interesting. I have never considered making jelly fish at home. Just one of those dishes that seem best left to the professionals. I love jellyfish too. Here in Myanmar, we usually eat it as a very spicy salad. It’s one of the ethnic cuisines of Rakhine people. The roasted duck looks delicious! Interesting – would never have guessed it was part of Rakhine cuisine. This restaurant sounds super nice, and they presented their dishes quite nicely – in comparison to the other ones you’ve blogged about. I’m realising that Chinese restaurants always present food in a modest way. I always try to find places with good service, so I’ll put this on my list. Thanks, Chris! I have a whole Google Map with places to visit in Hong Kong. When you go, let me know and I’ll share the link. Wow, that’s cool. Thanks for that. Wow! This is great! Thanks, Chris. I am wondering how the jellyfish tasted and it simply did not look appetizing to me. The pickled veggies and tofu, pork spare ribs, stir fried greens, and the simple fruit dessert looked totally yummy to me. My hubby loves sweet and spicy prawns and we go to our fav seaside eatery, in season in the summer, for wonderful meals of prawns. Have a wonderful week end. Jellyfish is one of those dishes that is never going to look great. The taste is a bit “oceanic” – slightly salty in a fresh way. It also picks up the taste of whatever ingredients are added – soy sauce, ginger, sesame oil, etc.